Wilmslow’s Mather & Co has completed the design of the largest cathedral visitor attraction in the country. The Undercroft chambers, Treasury and Crypt areas beneath York Minster reveal some of its hidden history, including a Roman barracks, Anglo-Saxon cemetery and the foundations of the Norman Minster. "Heritage Lottery Funding is vital in helping to sustain and transform our country's cultural heritage and nowhere is this better demonstrated than on the iconic York Minster. Working closely with the Chapter of York, Mather & Co has been delighted to bring its state of the art visitor attraction design and interpretation skills into this prestigious, historic arena,” said Mather & Co's managing director, Chris Mather. It uses a “ribbon” which extends throughout the 6 chambers and has been designed as a visual chronology device. 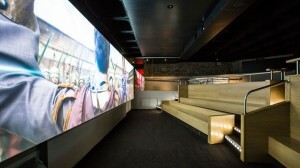 Visuals on the floor, ceilings and walls are used to move visitors from one area to the next. It also contains monolithic graphics, 3D computer reconstructions and interactive tables. "Working within the extremely challenging spaces of the Undercroft, our collections and stories provide the opportunity to challenge and stretch the boundaries of what can be achieved within a cathedral setting. 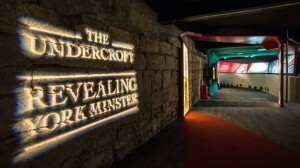 Revealing York Minster is a totally unique and exciting exhibition experience that drives the historical significance of York Minster home to every visitor,” stated project designer, Paul Lee. The 5 year project is the largest restoration and conservation project of its kind in the country and is due to be completed in 2016.